In 2017, we saw a record number of patients at The Raptor Center. Here, we break that down a bit. 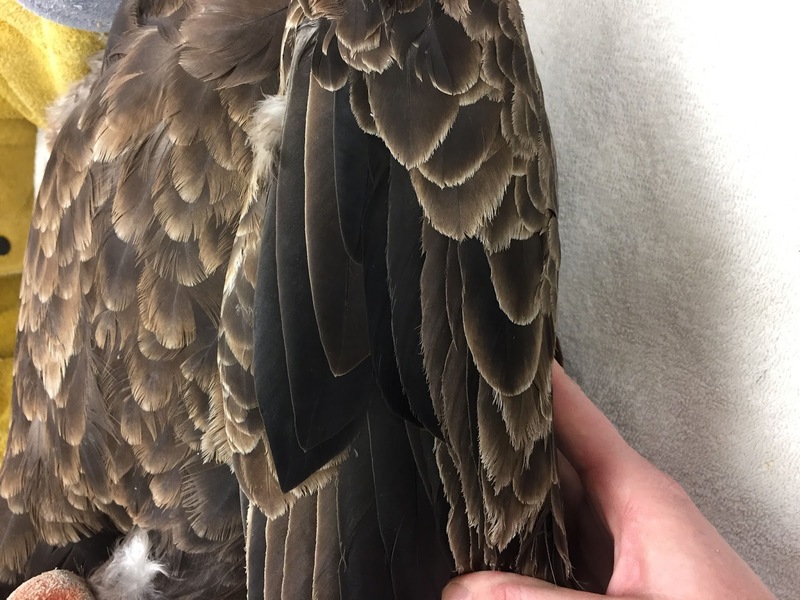 Where do these numbers come from, what do they mean, and how can you help protect raptors so they don't get injured or sick in the first place? From January 1 to December 31 of 2017, TRC received 1,085 patients. That's 27 more patients, or roughly 2 more patients per month in 2017 than in 2016. That also means that our clinic took at least 2,170 radiographs, 1,085 blood samples, and performed 1,085 physical/ophthalmic exams. And that's just for the admissions! Care of our patients often requires our clinic staff to go through these processes more than once, and in some cases, many times. *Several other patients were suspected to have collided with windows or vehicles because they were found close to windows/walls or on roads and due to the nature of their injuries. However, there was no witness to the event so it cannot be confirmed. Many of these injuries and illnesses can be prevented. So what can you do to help? Decorate your windows! Raptors and other birds flying into windows of homes and businesses is an unfortunately common occurrence. A simple solution is for home and business owners to apply patterns or decals to their windows. Research shows this to be effective in deterring birds from this often deadly behavior. You can find some of these products here. Use non-toxic ammunition! 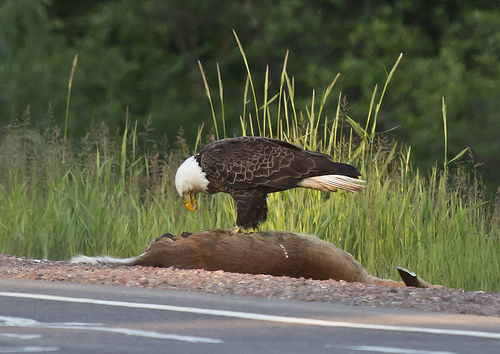 1 in 4 eagles in Minnesota are found to have toxic levels of lead in their bloodstream. This is the result of ingesting small lead-bullet fragments from the gut piles of hunted and cleaned deer left behind by hunters. Non-toxic ammunition alternatives are comparable to lead bullets in effectiveness and cost, and are readily available for use. Switching from lead to copper or other non-toxic ammunition is an easy way to prevent the risk of poisoning raptors when hunting. For more information, visit our website. 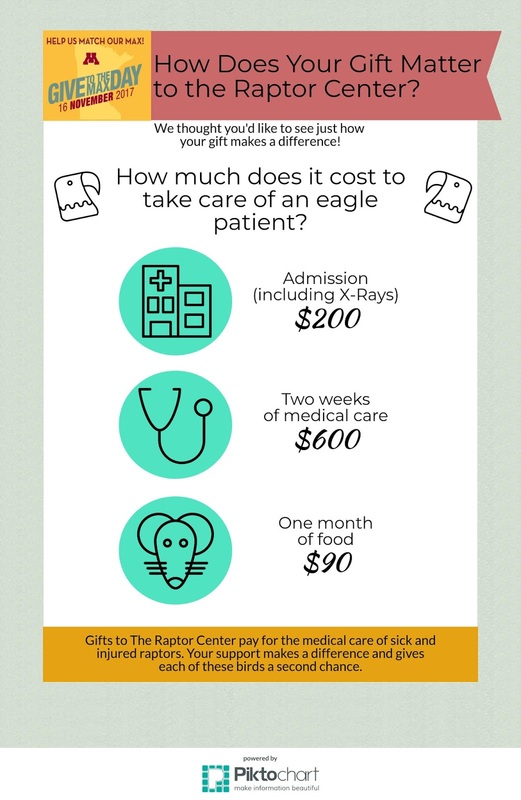 Consider a donation to The Raptor Center! Rising admission numbers means rising costs. As previously mentioned, the TRC clinic performed at least 2,170 radiographs, 1,085 physical exams, and took 1,085 blood samples in 2017. These tests and exams as well as the care of our patients is costly, and much of our funding comes from our donors. 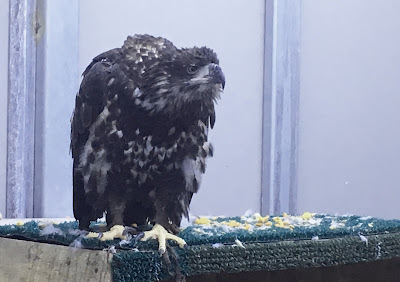 Please consider a gift to The Raptor Center today to help us continue our work. Thank you! Bald eagles, like other birds, molt feathers to replace older, worn ones with newer ones. It takes until between 5-7 years for a bald eagle to attain the white tail feathers that most of you associate with them. The photos below were taken of clinic patient eagles. You can see the pattern that is different/present on different ages of eagles. Tail feathers of a second-year bird. Tail feathers of a fourth-year bird. Tail feathers of an adult bird. The first photo is of a bird in its second year. The next is of a bird in its fourth year. And the final is that white tail that you all recognize. Feathers are fabulous! Not only is each feather on a bird’s body different from every other in length, shape, structure and function, but feathers also differ between species and between sexes and ages within a species. For example, young raptors often have noticeably longer flight feathers in the wings and tail which provide additional stabilization, making it easier to fly. This is similar to training wheels on a bicycle. The feathers at the top of the wrist are called “alulas”. They originate from the first digits of each wing, similar to our thumbs. The position of the alulas during flight can be altered to create drag for different flight maneuvers. 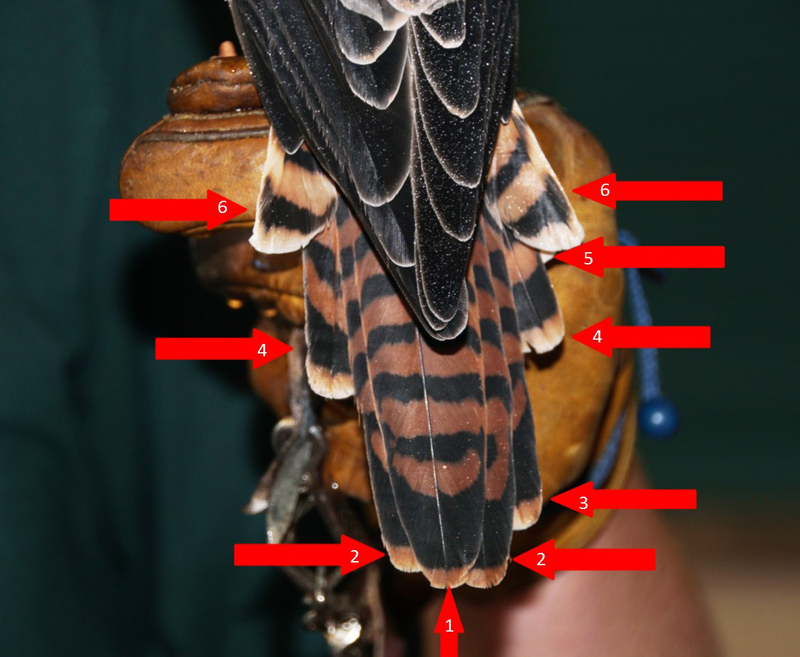 Raptors typically have between 3 to 5 alula feathers on each wing. We wanted to use feathers from Freedom, the bald eagle whose training you have been following, to demonstrate this. We keep all of the feathers that he has molted - which means he has already replaced some from when he was a hatch year bird last year. (Molted feathers are easy to place next to a ruler to show you measurement.) We are comparing them to a current bald eagle patient, since we could put a measuring tool next to them while the patient was on the table. What we will show you is that the alula feathers from a hatch year bird (Freedom's molted feathers) are a different length than those same feathers on a bird who is older. This is the wrist and alula feathers of a second year bald eagle patient. This is a ruler showing you the length. 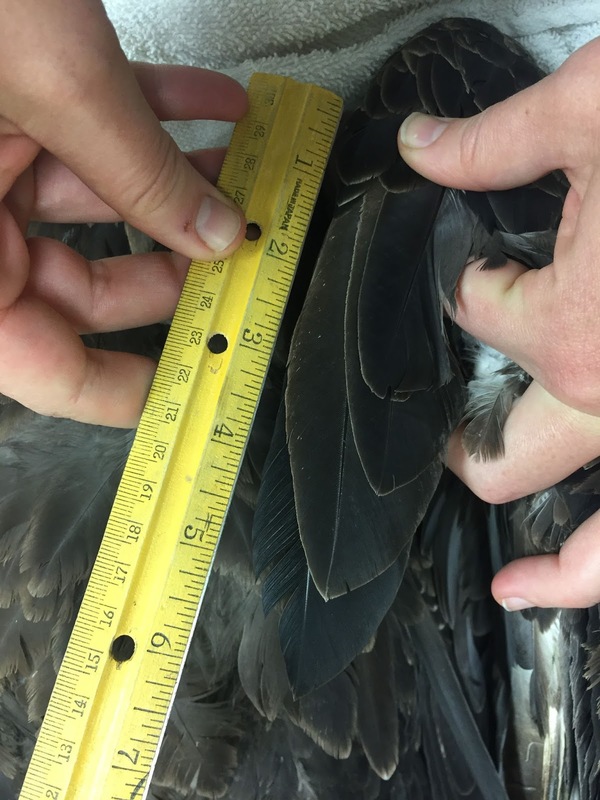 The second photo is of that patient bird, with a ruler next to the feathers, so you can see the measurement. The last photo is of Freedom's molted alula feathers from when he was a hatch year bird. They are almost three inches longer! 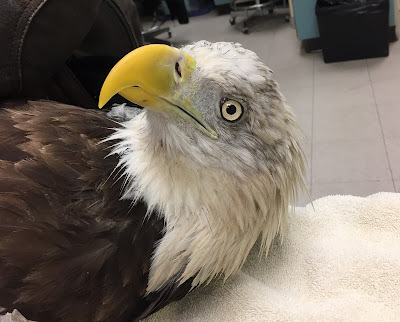 Bald eagle patient shortly before release! 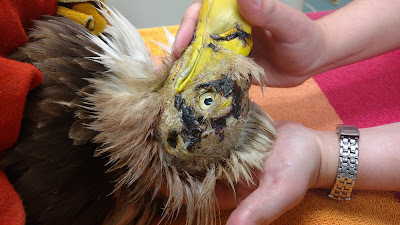 Bald eagle patient, after only several weeks in our clinic. this patient needed the care our clinic could provide. On Give to the Max day, we'd like to share with you a recent success story from our clinic that exemplifies the expertise, passion and commitment of TRC staff and volunteers. Each gift you give today will be a part of the ongoing care we are able to provide for patients like this bald eagle. An adult female bald eagle was admitted last May with extensive soft tissue injuries to the top of her head, a right wing droop, and trauma to her eyes. 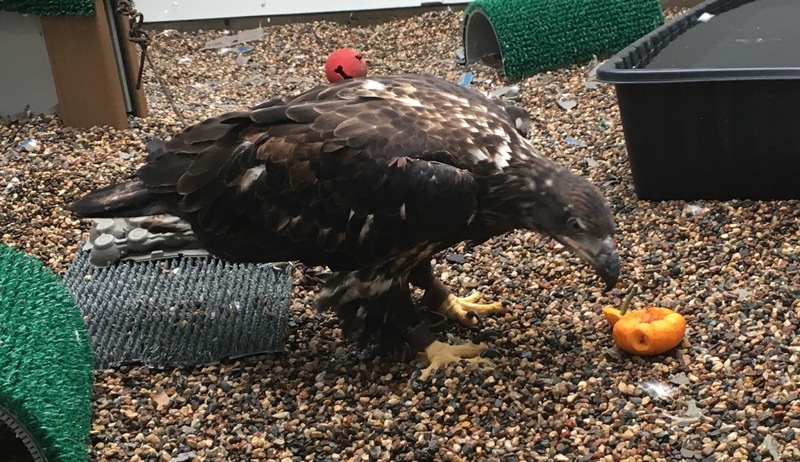 As is often the case, we don’t know what caused her injuries; however, we were captivated by this eagle’s spirit and survival attitude. patient was given the gift of freedom along the St. Croix River in Hastings. Will You "Give to the Max" for TRC Clinic Patients? TRC's biggest year for our clinic patient census was last year, when we admitted 1058. We currently have admitted 980 patients so far this year in 2017, and there is much of the year left! You can always find our clinic census here. We update it weekly. Will you please consider a gift so we can always be there to help sick and injured raptors admitted to our clinic? Every gift makes an impact. You can see how we put your gift to work in the graphic below. Part of our responsibility in the care and management of our winged education ambassadors is to keep their minds as healthy as their bodies. One way to do this is to provide enrichment in how their food is presented. This encourages natural behavior by engaging the birds’ minds, feet, and eyes, as well as making the activities of finding food and eating last longer. The birds do need to be taught how to interact with their enrichment activities, however. 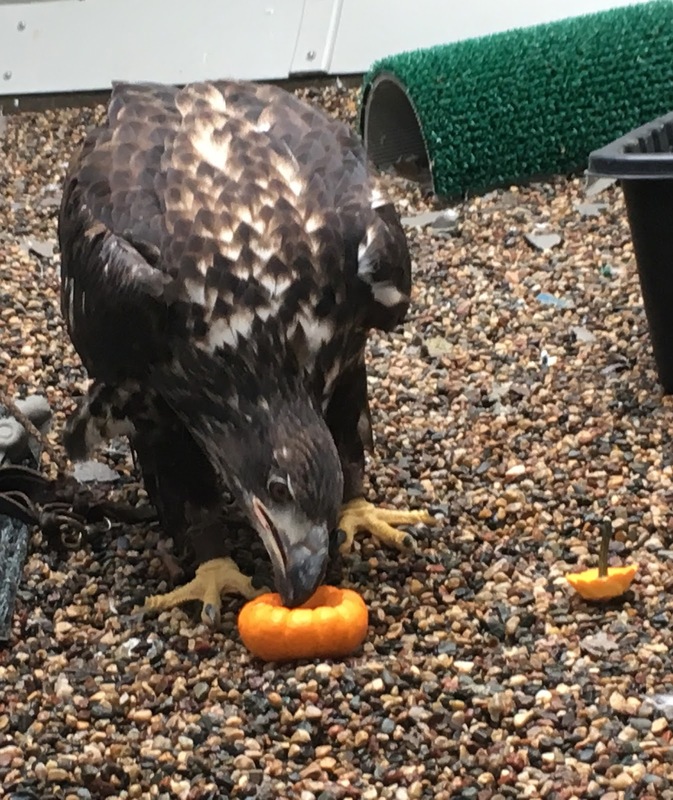 In this video, Freedom was presented with his rat lunch, but it is inside a pumpkin, carved by our TRC volunteers! 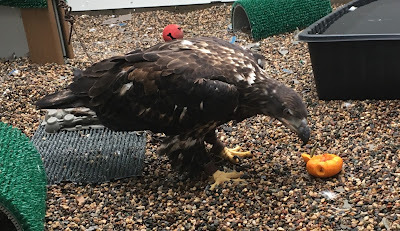 Freedom recognizes his lunch, but not the object in which it is housed. You can see how he is a little hesitant as he first approaches the pumpkin. He is able to grab a piece of the rat, and then quickly moves to a safer location in his housing in which to eat it. 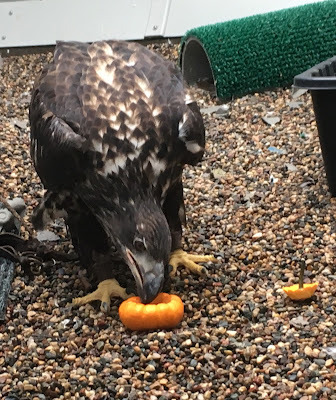 He is still curious, so he takes a moment to consider, but then approaches the pumpkin with more confidence. He even eats one piece right there! You can clearly see his process of learning how to interact with his enrichment in the video. The photos also capture his “journey”. The last photo was taken the next morning. Freedom did “disassemble” his pumpkin into tiny pieces! Note – the leather straps on Freedom’s ankles are part of his equipment, called bracelets and jesses. As you can see, he has learned how to move very comfortably with them. They are used with all of our education birds in their management. Let's Talk About Tail Molt! Darner the American kestrel graciously agreed to be the model and teacher today for a lesson on tail molt! Raptors have 12 tail feathers - six on each side. When they molt, which is the process to replace these and other feathers due to wear, they will ideally molt symmetrically. So - if you think of the tail as six feathers on the left side, and six feathers on the right, then the tail molt should happen with the 6's on the left and right molting at the same time. You can see from the photo that this is true. While some feathers were hidden a bit when Darner was on the glove after lunch and a spritz water bath, you can see very clearly that both of Darner's number 6's and number 4's are coming in nicely.